20150602 - Up in the am and into work. Full crazy day. 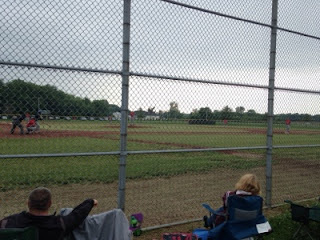 Jumped on the road and headed to Chilicothe to see D and Drew play their first game with the Pickerington travel team. They played every other inning and did good. D played 2nd, got a K and singles to center and left and scored 1. The team had an early lead but ended up losing 9-5. I carried D & Drew home with a stop at a Chonese buffet. Home late.